What is the first question players are asked after a match? “How did you do?” Most players, shaped by the standards set in our society, naturally respond, “I won” or “I lost.” Usually, this is the end of the conversation. Unfortunately, the communicated message is that winning is what counts. As a result, players learn to focus on outcome, play more tentatively in competition, and even base their self-worth on winning and losing. Typically, when players equate their self-worth with results, they will begin to experience performance anxiety. 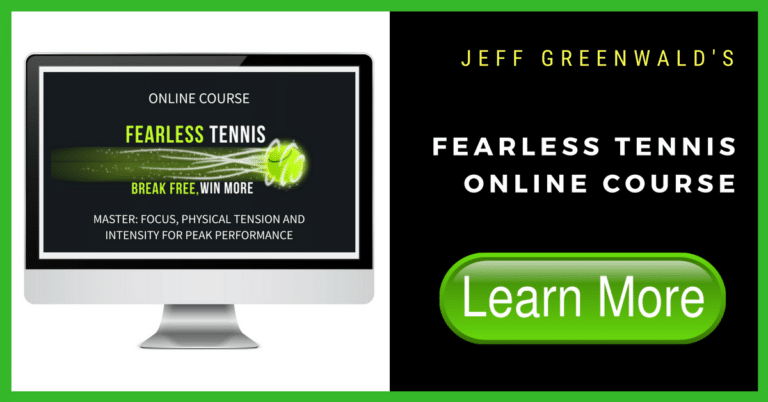 Invariably, this hyper-aroused mental and physical state causes players to play more tentatively, disrupting fluid biomechanics, causing unforced errors, which can lead to anger, tanking, even burnout. However, results alone, without the connection to a player’s self-worth, are usually very beneficial. Here, results can actually enhance a player’s motivation, provide important feedback, and help players establish short and long-term goals. Most importantly, players need to keep winning in perspective and truly use the feedback appropriately. Becoming overly attached to the outcome and losing the learning opportunity are, ultimately, inhibiting to a player’s long-term development. Players who learn to narrow their focus to “process cues” in matches can overcome their tendency to dwell on results. For example, reminding yourself to use your weapons and attack your opponent’s weaknesses, focusing closely on the ball, taking relaxing breaths, and recognizing winning shot patterns are all examples of a process focus (i.e. “Stay loose, work his backhand and step up on your forehand”). In addition, as you play, begin noticing what you say to yourself during matches, particularly when the match is close. As the match becomes closer, you may notice your focus shifting to the thought of results. Catch this early and turn it around in your mind. Remind yourself to compete hard, that you love competition – especially when it’s close – and continue to play one point at a time. Remember, you are playing for the future and this match is only a stepping stone toward your long-term goals. Relish the pressure and the opportunity to test yourself (“I love this”). Putting a particularly nerve racking match in perspective like this can promote relaxation and allow you to swing more fluidly through your shots. As you do this, you will gain confidence in your skills, particularly in your ability to control your thoughts and tension levels. Because you are loose, your shots are likely to improve, and that will generate a feeling of self-control – one of the key components of the “zone”. Assess your arousal level (physical energy) in practice and matches. Identify what feels best for you and number it 1-10 (10 being extremely pumped up, 1 resting). Become familiar with this ideal level and make it a goal to get yourself in that state. Deep breathing and positive self-talk are effective. Focus on your breathing for at least ten minutes before you play. All focus should be on your breath without any thoughts. Let your thoughts dissipate as you exhale. Commit to going for your shots before you walk onto the court. Begin to separate your results from your self-image by changing your inner self-talk. ocus on specific shot patterns (i.e. Crosscourt forehands and then down the line on shorter balls). Practice these patterns until they become automatic in competition.